Sorry, Mom. These are the best meatballs I’ve ever had. These meatballs are juicy and tender and somehow fluffy, without falling apart. Even the accompanying sauce is otherworldly. The muscled-up marinara uses San Marzano tomatoes, famous for their bright, fruity flavor, and reserved meatball juices for extra awesomeness. If you’re going to tackle this recipe, here’s what you need to know: It takes a lot of love (and a few hours in the kitchen) to make a life-changing meatball. Start early. Chop with a buddy if possible to speed things up. Once everything is diced and minced, it might look like a lot of stuff to mix with your 1.5 pounds of meat. Trust the recipe. But don’t let all that deter you. There are only so many times in life you get to combine this many kinds of meat without ending up with some atrocity like a turducken. Seize the opportunity. 1. In a medium sauté pan heat the olive oil over medium. Add the guanciale or pancetta and sauté until it begins to brown, about 5 minutes. 2. Add the garlic, onion, fennel, chilies, and sundried tomatoes. Cook until the onions are translucent, stirring frequently, about 10 minutes. Season with salt and pepper, and then transfer the mixture to a bowl. Place the bowl in the fridge until the mixture cools, about 20 minutes. 3. In a large mixing bowl, combine the chilled mixture with the remaining ingredients and mix well. In a small, lightly oiled sauté pan, cook a small portion of the meat mixture to taste it. Adjust the seasonings, if necessary. Roll the mixture into 3-ounce meatballs and place each on a parchment-lined pan. Place the sheet in the fridge and chill for at least 2 hours. 4. Preheat oven to 300°F. 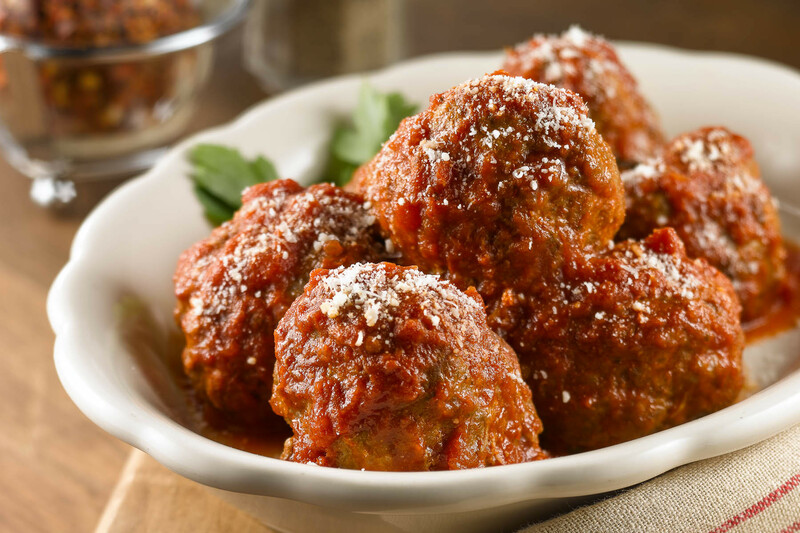 Place the sheet of meatballs in the oven and cook to an internal temperature of 165°F, about 45 minutes. Allow the meatballs to cool slightly before serving. (If you’re making the sauce recipe below, save any juices.) Makes about 20 large meatballs. 1. In a large pot over medium heat, add the garlic, onions, and olive oil. Cook, stirring frequently, until the onions are soft and translucent, about 7 minutes. 2. Stir in the tomato paste, and cook, stirring frequently, until caramelized, about 10 minutes. Add the tomatoes, reserved meatball juices, and the basil sprig. Bring the mixture to a simmer and cook, stirring occasionally, until the tomatoes break down and reach a sauce-like consistency, about 2 hours. Season with salt and pepper. 3. Add the meatballs and simmer until the flavors combine, about 20 minutes. Serve immediately tossed with pasta or with a thick slice of Italian bread. Makes 8 to 10 servings.